Def Leppard and KISS continued the Summer Tour 2014 last night in Holmdel, NJ with a 14 song set played. The band played the regular 75 minute set at Jiffy Lube Live. The show started with the live snippet of 'Won't Get Fooled Again'. The rest of the show was the usual set with no changes from Bristow. This was the last show of leg one of the tour which resumes after a five day break on 1st August. 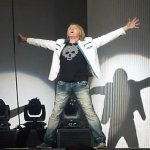 Joe Elliott's 55th birthday. An early birthday present for Joe as he got to be the introduction voice for the traditional KISS entrance. Watch the video where Joe uttered their immortal intro of - 'You wanted the best, You got the best...'. The next show takes place on 1st August in Boston/Mansfield, MA.